I've always worn a full face helmet and drooled over the features of modular helmets. I have never bought a modular because I don't trust the ones I can afford. I'm waiting for the technology to advance or the price to come down. In the meantime, there is an economical alternative -- and that is an open face helmet. I'm certain that everyone sees the disadvantages, so there is no sense in ignoring them. These are going to be louder and do not offer the protection of a chin bar of the full face helmets, but there are a few pros that make the cons less significant. For one, these are great for anyone who wears glasses. You can pull your helmet off and on without having to find a place to set your eyewear. Taking a drink is also much easier with an open face helmet. More than once I've been too lazy to remove my helmet for a quick gulp of water and ended up pouring it down my chest, much to my embarrassment. It may not seem like a safety concern, but being able to stay hydrated makes it more likely that you will stay hydrated. That can save you the headache I'm currently experiencing after my 500 mile, under-hydrated ride yesterday. 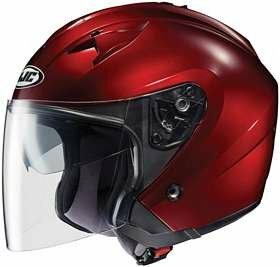 The polycarbonate composite shell and impact-absorbing, multi-density EPS liner helps this little helmet earn its DOT certification. The shield is 95 percent UV protective and is optically correct. To add comfort to all of this protection and convenience, the lining is washable, antibacterial, and moisture wicking. If you can afford a high-end modular, that might be better. Otherwise, this is a great way to combine modular convenience and ample protection.